Shenae Anderson (16) began studying the violin at age three with Deborah Moench. She has soloed with Utah Symphony in 2008 and 2010 for Salute to Youth. In December of 2010, she was invited back by Maestro Thierry Fisher to be a guest soloist with the Utah Symphony for its assistant conductor auditions. Since 2008, she has won numerous competitions, including, Youth Guild, MTNA, and Utah State Fair. Shenae was the winner of Stradivarius International Violin Competition Utah Division in 2013. 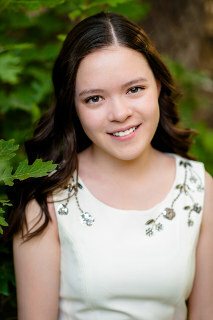 Summer of 2013, she studied with Robert Lipsett at the Aspen Music Festival in Colorado. 2014, Shenae auditioned at Curtis Institute of Music and was one of the 13 finalists out of 130 applicants. Shenae will perform with Salt Lake Symphony in April of 2015 with full Beethoven Concerto. Shenae has had master classes with David Kim, Robert Lipsett, James Eness, Andres Cardnes, Joseph Silverstein and Roberto Diaz. Shenae has 4.0 GPA and will be graduating a year early from Summit Academy High School in Draper. She is currently studying with Eugene Watanabe.